A gelding is a male horse who has been neutered so he cannot reproduce. Turning a colt or stallion into a gelding prevents unwanted reproduction and drastically reduces hormone-induced behaviors. Geldings are generally considered to be safer, more reliable horses than stallions. Geldings are supposed to have low testosterone -- that's generally considered one of the benefits of gelding a horse. Stallions produce most of their testosterone in their testicles -- so removing the testicles and related tissue dramatically reduces the amount of testosterone in the body. According to HorseChannel.com, a stallion's testosterone level drops by more than half almost immediately after gelding. High testosterone levels are commonly considered the cause of most aggressive and difficult-to-handle stallion behaviors; therefore normal-to-high testosterone levels are seen as undesirable by most horse owners. 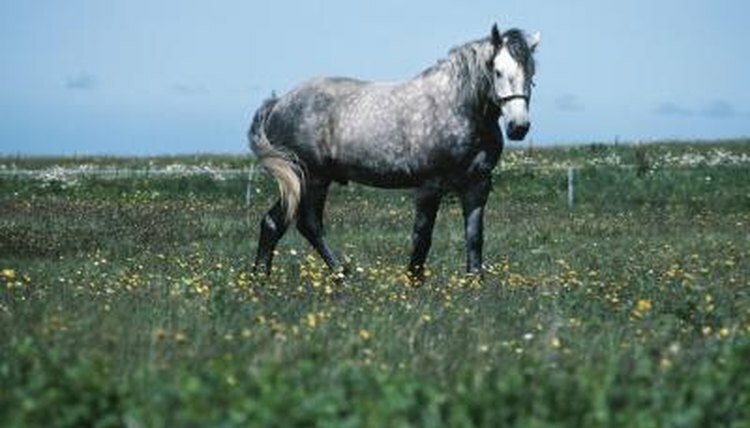 Mature geldings tend to be taller than mature stallions who share the same bloodlines. Gelding a colt early in his life will result in a slower closing of the growth plates, which in turn can allow the gelded horse to grow taller. Geldings are also not as thick through the neck and generally do not have the heavy, muscular build commonly seen in stallions. Horses can be gelded any time after about 4 months of age. Gelding a horse will significantly decrease his desire to display mating behaviors. Many stallion owners choose to geld horses in order to eliminate aggressive behaviors toward horses and humans, the desire to mount mares, the desire to call out to mares and general stud-like behavior. Geldings are often easier to train than stallions because they are less prone to distraction and more cooperative as a whole. Geldings are also considered to be safer, more predictable riding horses than stallions due to the absence of hormone-driven behaviors. Geldings who do not have low testosterone levels were not gelded properly. In the case of a "proud cut" gelding, enough tissue was left behind that the gelding still produces testosterone and often behaves in a manner more similar to a stallion than a gelding. The term cryptorchid refers to an animal who retained one or both testicles inside the body. If a horse's undescended testicle is not located and removed during the gelding process, the horse will continue to produce testosterone at normal or nearly normal levels.